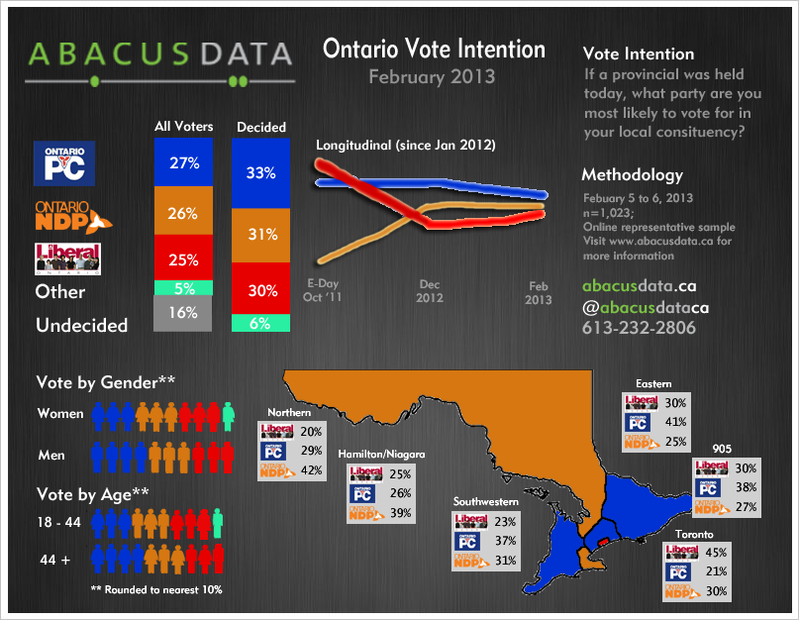 No major bounce yet for Wynne; Liberals lead in Toronto but trail everywhere else. As Kathleen Wynne and her new Cabinet are sworn in on Monday, a new provincial survey by public opinion firm Abacus Data finds the main political parties in Ontario in a tight three-way race. Province-wide the Progressive Conservative Party has the support of 33% of decided voters followed by 31% for the NDP led by Andrea Horwath, and 30% for the incumbent Liberals. The results for each party are largely unchanged since Abacus Data’s last survey in December 2012 that found the PCs (35%) with a four point lead over the NDP (31%) and the Liberals in third with 28%. Regionally, the Liberal support is concentrated in Toronto (416 area code) where 45% of decided voters said they would vote Liberal if a provincial election was held at the time of the survey. In every region outside of Toronto, the Liberals trail in either second or third place. The Progressive Conservatives lead in the Greater Toronto Area (905 area code), in Eastern Ontario, and in Southwestern Ontario while the NDP leads in Northern Ontario. A significant portion of Ontarians remain undecided about which party they would support if a provincial election was held at the time of the survey. Overall, 16% said they were not leaning towards voting for any party. In Abacus’ December 2012 survey, 20% of past Liberal voters said they were undecided about which party they would vote for. That number is now down to 6%. The Ontario political system is in a three-way standoff. Support for the Progressive Conservatives has reached a plateau despite Tim Hudak’s efforts in recent weeks to release new policy white papers and increase his presence in the media. Kathleen Wynne’s victory at the Liberal Leadership Convention at the end of January has yet to produce to a significant bounce in Liberal support but with the exit of senior and controversial members of the previous government (including Dalton McGuinty himself), Wynne has an opportunity to recast the government and rebuild trust with past Liberal voters who have decided to vote PC or NDP now. The NDP is perhaps in the best position right now only because its standing is significantly better than its showing in the last provincial election. Its growth may have stalled for now but as the most popular leader in the province, Andrea Horwath likely has the best opportunity to grow support across the province. The survey was conducted online with 1,020 respondents in English and French using an internet survey programmed and collected by Abacus Data. A random sample of panelists was invited to participate in the survey from a panel of over 150,000 Canadians. The survey was completed from February 5 to 6, 2013. The margin of error for a probability-based random sample of 1,020 respondents using a probability sample is +/- 3.1%, 19 times out of 20. The data was weighted according to census data to ensure that the sample matched Ontario’s population according to age, gender, education level, and region.